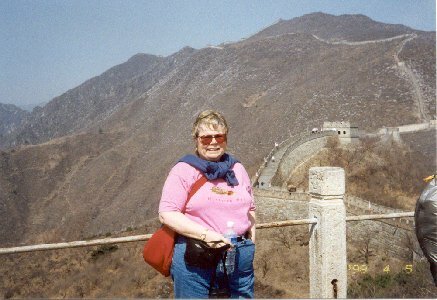 In spring (April) 1998, I took a 9-day tour to China. We traveled to several cities: Beijing, Xi'an, Guilin, and Shanghai. Our first stop was Beijing and our first official tour of the day was a trip to the Great Wall of China. Here I had just finished the gondola ride from the base site near Beijing and was preparing to climb to the top of the wall. The length of the Great Wall is officially given as 6,350 kilometers (3,946.55 miles) from Jiayuguan to Shanhaiguan. There are many offshoots and parallel walls so some scholars add another 1,040 kilometers all the way to the Yalu River on the Korean border. For those of you who are looking closely enough to spot the date on the picture, it's a year off; I was having a spot of camera trouble.